Gado Gado is one of the famous Indonesian dishes. 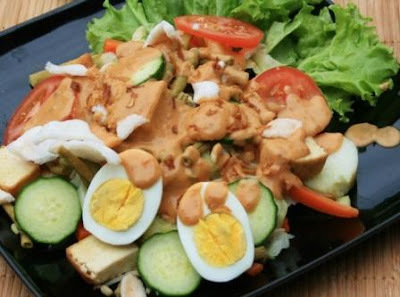 Although it is almost like salad, Gado Gado is also eaten as meal in Indonesia. It is included with various vegetables and carbohydrates that come from the rice cake/ lontong and potatoes. Tofu, eggs, tempe is a good source of protein. This food is usually served with peanut sauce. The spice peanut sauce makes gado gado more delicious. It may look scary with the the numbers of ingredients, however this recipe is very flexible with a choice of any ingredients you want. Here are the recipes of gado gado. Bake peanut in the oven at 170C for 5 minutes. Put beans, shrimp paste, garlic, pepper, palm sugar, in processor of food. Grind everything until it is combined well. Transfer it to a bowl. Add water of tamarind, lemon juice, soy sauce and half a cup of water. Stir it and add enough water to get peanut sauce texture which you want. Rub 1 teaspoon of vegetable oil into tofu and tempe slices and place it in the oven for about 15 minutes. Or, put in tofu and tempe in the pan for the fry for 1 minute on medium heat. At the same time, bring water in 2 small pots to cook potatoes and eggs. After one minute, and turn off the heat and a bowl with the eggs and let it for about 12 minutes. Remove the shell eggs and cut into quarters. Cook potatoes until soft. Pale remaining vegetables in boiled water and remove it with a slotted spoon. To serve it, put each component of gado dado in the plate / bowl. Pour Peanut sauce in it. You can eat it both cold or warm.